From 1996 through 2000 Kongsgaard bought two tons of Syrah fruit annually, but after Jade Mountain, another client of Hudson’s, was sold, Kongsgaard was able to get all five tons of fruit from this 2-1/2-acre, southwest-facing hillside site, which Kongsgaard describes as “one of the rare instances in Carneros where the volcanics are on the surface.” Carneros, he explained, normally features ocean deposits of shale and clay from 20 million years ago. But during the volcanic period 6 million years ago, there were vents in the ground through which ash and lava flowed out. “So we have a very interesting combination of mineral content and cool conditions near San Pablo Bay,” he summarized. The distinctiveness of the site, in conjunction with low crop levels and Kongsgaard’s minimal-intervention winemaking, has produced what is arguably California’s greatest single Syrah bottling. When the 1996 was released, it was also the most expensive Syrah in California—and intentionally so. “We didn’t want to make Syrah unless we could compete at the world level, just as with Cabernet Sauvignon in Napa Valley,” Kongsgaard explained. As the fruit comes in cold from the vineyard it normally takes four or five days to start fermenting with its indigenous yeasts. Kongsgaard describes his vinification as “fairly northern Rhône from the start,” noting that he “makes wine against the fruit.” He begins by destemming the grapes, explaining that “our wine is already peppery enough, with good color stability, and sufficiently tannic without the stems.” Total cuvaison time during the “medium-hot” fermentation is about three weeks, with two pumpovers per day at the beginning of the fermentation, then one a day for the second part of the process. “Then we simply keep the cap wet during seven days of post-fermentation maceration,” he noted. “There are never problems with the fermentation of Syrah and we always finish by Thanksgiving.” The wine spends about 20 months in 50%-new French oak barrels, mostly supplied by François Frères and Billon. Of that first Kongsgaard Syrah from 1996, not a bottle remains. And the wine was not sold commercially in 1997, so my otherwise comprehensive tasting began with the 1998 release. 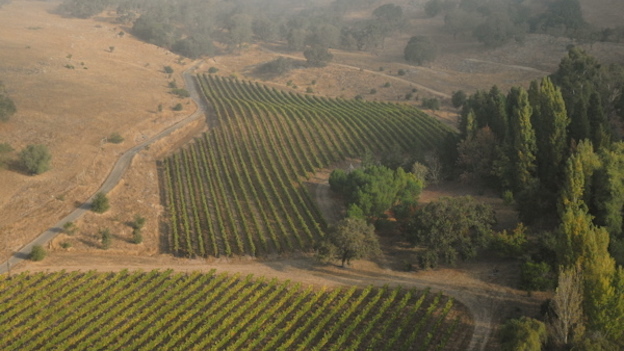 Nowadays Kongsgaard normally has about 15 barrels of Syrah—with vine yields typically under two tons per acre. But in 2015 there were only eight barrels of wine, and in 2011, the only growing season that suffered from rot problems, Kongsgaard ended up making just four barrels of wine. Alcohol levels are virtually always between 14.5% and 16% alcohol and Kongsgaard has never acidified his Syrah. As a rule, the wines show excellent freshness and energy, which Kongsgaard attributes largely to the natural lift provided by the rocky soil. “The sparky, flinty minerality in the wine definitely comes from the vineyard,” he told me. I tasted these exciting wines with Kongsgaard in his cave cut into volcanic rock at his home on Atlas Peak. While they are indeed “minerally, energetic wines . . . more about soil than fruit,” consistent with Kongsgaard’s objective, they are also wonderfully rich and complex, and are evolving at a deliciously slow pace.